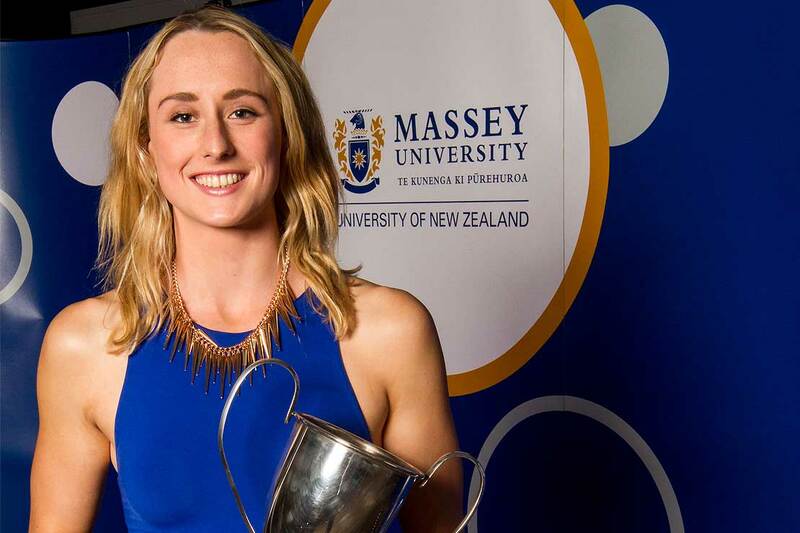 Swimmer Laura Quilter is among the team representing New Zealand at the World Uni Games. Massey students make up a quarter of the New Zealand Universities team attending the World Universities Games in South Korea this month. Sixteen of the 66 athletes are from Massey; 14 are studying at overseas universities and the others are from New Zealand universities and other tertiary institutions. Among them is swimmer Laura Quilter, who won a Massey Blues award two years ago at the Auckland campus. Massey's extensive distance education offering has always made it a popular choice for those competing in sport nationally and internationally. Athletics, with 30 athletes, is sending its largest ever contingent to the games and swimming is also sending a large team of 16. The New Zealand team members will also compete in table tennis, rowing, fencing and artistic gymnastics. Included in the athletics team is Angie Petty, who finished fourth in the 800m and 1500m at the last Games in Kazan, Russia; Eliza McCartney, who won bronze in pole vault at last year’s junior world athletics champs, and double silver Commonwealth Games medallist Nikki Hamblin who will race the 1500m. Swimmers Kate Godfrey and Laura Quilter are among those returning to a World University Games after competing at the 2013 Games in Kazan. Massey rower Toby Cunliffe-Steel will be competing in his second Universiade regatta, after competing in the men’s lightweight double scull in 2013 where he finished seventh. This is the fourth time a New Zealand table tennis team has gone to the Games. The World University Games is a major international sporting event that is held every two years for student athletes from around the world. This year more than 13,000 athletes from 141 countries will be competing in Gwangju for the 28th biennial event. This compares to around 10,000 competitors from 205 nations at an Olympic Games. In some sports, the competition fields will be tougher than at a Commonwealth Games, as sporting powerhouses such as Russia, China and the United States send teams. New Zealand Team chef de mission Christine Arthur says that for many athletes, the World University Games will be their first experience of competing at a multi-sport, international event. Some athletes will be aiming to use the games as a stepping stone towards selection to senior world championships and Olympic Games. "Competing at the games is significant, as it closely resembles an Olympic Games,’’ Ms Arthur, a two-time Olympian, says. "For some of the athletes, this will be the pinnacle of their sporting careers and, for others it will be a springboard to the Olympic Games." The New Zealand Olympic Committee is managing the team and carrying out the logistics, as it has done for the two previous World University Games. The competition in Gwangju runs from 3-14 July.